As you can probably tell by just glancing at my blog that I have a tendency to read fiction over non-fiction. Not necessarily because I dislike non-fiction, but perhaps because I am pickier about the topics that I read about in the non-fiction "genre". While I'm willing to maybe pick up something unfamiliar in a fictional frame, there's a part of me that remembers all the dense and incomprehensible textbooks from university that presupposed a certain level of prior knowledge whenever I glance at the non-fiction section. This time though, I decided to bite the bullet, and settled on a subject that I at least have experience of. 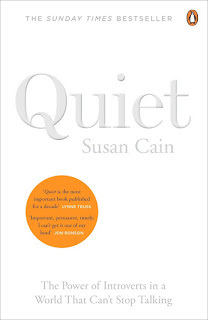 Quiet: The Power of Introverts in a World that Can't Stop Talking focuses on the role of introversion and extraversion in society, particularly focusing on the obsession that Western cultures have with extraversion. With such a focus on charisma and the ability to sell yourself in the workplace, Quiet discusses the ways that introverts can use their more understated talents to get ahead, and why being the loudest person in the room doesn't guarantee that you're the best person for the job. As is probably obvious, I am firmly in the introvert camp, and so was hoping that this might give me some insight into promoting myself better without having to change my core antisocial nature. While I may have a ways left to go, Quiet was certainly an interesting starting point. Starting with the origins of what Cain refers to as the "Extrovert Ideal", she then looks into how this focus of extraversion can lead to disastrous results, how introverts can flourish in business by relying on innate strengths, when it is appropriate to act in an outwardly extraverted manner and how the two personality types can benefit from each other. Admittedly, a lot of the points in principle seem kind of obvious to me, having experienced a lot of this firsthand, but the psychology and neuroscience behind it is fascinating. Like, it's not especially surprising that introverts are risk-averse compared to extraverts' more high-risk, high-reward attitude, but the fact that this is down to how each personality-type processes dopamine, amongst other things, is really interesting. And if you wanted to look further into a specific aspect of the overall subject, Cain has provided a detailed list of works that she has cited, so if she doesn't go into quite the level of depth that you would like then she's provided the means to do further research. Next review: Go Get a Roomie Volume 1 by Chloe C.